January | 2015 | That Was an Accident! Thoughts: So I had finally transitioned away from keeping track of my planned mogs with Ye Olde Fashioned Notebooke to making more mogs than I could follow up on with the Mogit addon. Hooray for technology! And then I switched computers without writing down what said sets consisted of. Cav was not very supportive, and he said I should just start over. I whimpered and cried and threw mini-mog-fits, but I eventually did, if only because I can’t keep my little green hands off Mogit and Gawd knows I’m too lazy to reconnect my old computer just to figure out what was in every last set I’d come up with. 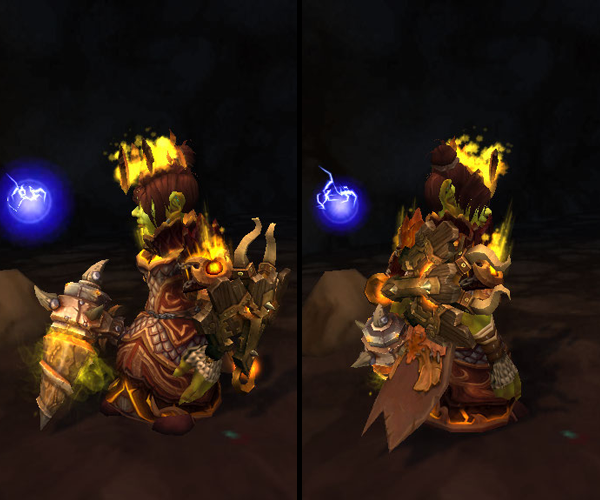 I started this particular set out of convenience – at some point, while clearing out my storage space (yet again), I saw I had most of the yellow version of the shaman tier from Firelands. Cool beans, the set is half done and I haven’t even left my Garrison yet! The S.B.R.B. Prototype 3 boots are a quest reward from the goblin starting zone (I KNOW, I’VE HUNG ONTO THEM FOR THAT FREAKING LONG), so if you’re not a goblin and/or did not keep them, you’ll need an alternative. There is a lookalike for the shoulders should any hunter want to dress up like a shaman, but no lookalike for the helm. As far as the Plunderer’s Drill goes, it seemed so dang perfect for a goblin. It has a high drop rate, but keep in mind that the rare that drops it (the Mecha Plunderer) is in a daily quest area and has a respawn time of about an hour and a half – so unless you camp it, have a plan and/or get plain lucky, it can be some time before you spot it. I achieved success by parking Bombelina next to the spawn site and checking it at ridiculously early morning hours (the things I do for mog …). I believe sacrificing blood elves to the Mecha Plunderer also improved my chances. 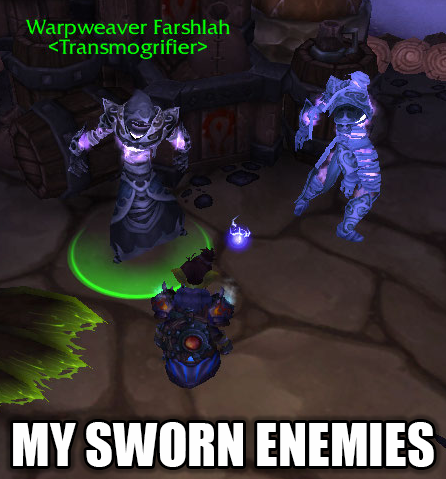 I mean, uh, Aeda Brightdawn kept taunting the thing like she taunts every possible mob in a five mile radius, but she can’t take the beating she invites and that’s not my fault. So, yeah, I totally used her as a tank knowing she’d drop dead before the mob did. That is my fault, but it worked out so well. This entry was posted in Bombelina, For the Horde, Baby!, Goblins, Mail, Transmog, World of Warcraft and tagged aeda brightdawn, coldsinger cloak, erupting volcanic headpiece, erupting volcanic spaulders, gatekeeper's embrace, goblins, mail, nimblefinger scaled gloves, plunderer's drill, protector of frigid souls, s.b.r.b prototype 3, sacrificial blood (elves), shaman, transmogging, varashi belt, world of warcraft on January 25, 2015 by Prinnie Powah. I just got the level 3 Storehouse. FINALLY, right? MY OWN TRANSMOG JOINT. So I sprint the hell over, all thrilled, and I start trying out different combinations of the stuff I have in storage. This could work with this, and that might go well, and let’s try that weapon, and how about dem shoes when all of a sudden, the @#%$er moves, the dialog closes, and I am filled with nerdrage. I take a deep breath. I try again. Off Warpweaver Farshlah goes to look at that other box. You know, the one he looked at a minute ago. It’s not like I can RUSH! I can’t just mog any old thing together! My combinations must be chosen carefully! They require thought! A solid judgement of color! A sense of proportion! SOMETIMES I HAVEN’T EVEN SELECTED AN ITEM YET AND HE MOVES. Let’s try organizing Void Storage. 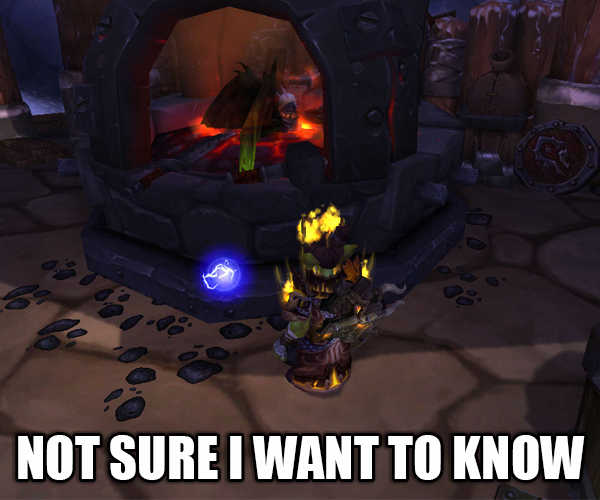 Sometimes, it’s just better to let burning warlocks burn. My followers are always birds of a feather, so to speak. Thermalix is swamped with followers who can counter Minion Swarms, and I’ve only had one mission to get a follower retraining certificate. This is a certified pain in the whozawhatzit when considered from the perspective of my Plan: Gobligeddon*. The first time I used my inn to recruit a follower, I searched for the Scavenger trait. I had not gotten a follower with it Hordeside, and Bombelina was in the throes of a resource shortage due to the way a high population server can clear-cut the entirety of Gorgrond in a minute or less. (I have since discovered that if I log on at four a.m. server time, TREES EVERYWHERE.) Once I started leveling this follower, though, it occurred to me that the Scavenger trait is actually kinda pointless. Number one, it’s not like you get that many missions for garrison resources, and number two, the mission probably has a threat said follower can’t counter and will fail in attempting anyway. Gathering resources is sometimes difficult. So screw that. My current plan is to look exclusively for followers with Epic Mount, and pray to Gawd that they also have an ability that would actually be useful to me (if it’s Minion Swarms or Timed Battle, I will possibly have to punch someone). The higher level missions are always ridiculously long, which I find problematic. I only play for a couple/few hours in the evening, and sometimes in the morning before I leave for work. I’d like to see my salvage crates followers more than once in a blue moon, thank you very much! I will not be asking the Tauren to be my guards anytime soon kthxbye. 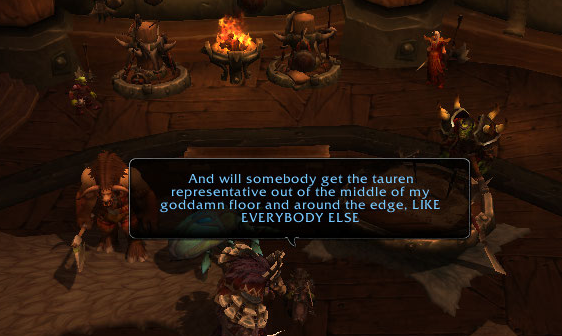 Can someone tell that Tauren representative to get out of the middle of the room? He BOTHERS me. He just STANDS there and scratches himself. He doesn’t walk around, or tell jokes, or say hi, or anything! No, he just stands there like a creepy cow. Oh! You mean that troll guy I ignore because he always says the same boring thing to me when I leave the building! Why the hell did Blizzard make it so that everybody in your faction is doing the quest in the same place on the same damn day? I mean, really. PITA on a high pop server for sure, as you have to be constantly on the lookout for things that aren’t dead. They’re hard to find. * Every single active follower will some day be either a goblin or some sort of mechanical contraption, like Pleasure-Bot 8000. Since you can’t search for followers by race (or, errr, metal type? ), retraining certificates would make this much easier! This entry was posted in Bombelina, For the Horde, Baby!, Goblins, Thermalix, World of Warcraft and tagged bombelina (formerly electrika), followers, garrisons, goblins, maybe someday will be better, that's probably not good, thermalix, world of warcraft on January 18, 2015 by Prinnie Powah. So last week I moved, and it was A Week, which essentially means that every single day was written off as total crap. I’d decided that as soon as we got the internet working in the new place, I had to play WoW. Therefore, I set myself up on a little end table (my desk had not yet been moved) and dinged my knee pretty hard so that I could try out at least one wing of the new LFR. Nope nope, outdated. Start over. So my various families observed the holidays last week, which essentially means that every single day was devoted to things “in the real world” and not the digital. This is me, though, so I snuck away for a little WoW time here and there! Oh wait, it’s outdated again! You know what, forget it. This, children, is why you should publish your blog posts before a million things happen, because otherwise you do more things and you’ve gotta revise. Repeatedly. I also recently switched to a new computer. While my four year old CPU was literally a tower of processing power at one time, it has now been eclipsed by a creation capable of showing reflections on water surfaces, and ripples on the water, and dramatic views off into the far distance, and light beams and all that fancy visual crap! Alas, I was too excited to transfer all my screenshots at that time, so while they are not exactly lost, they are unavailable at the time of this posting. GIFS FOR ALL INSTEAD. While waiting in the long DPS queue, I pondered why you had to get a silver in the proving grounds for heroic dungeons, but not for LFR, even though incompetence would inconvenience a far larger group of people in the latter. To me, the “natural order” has always been something like Dungeons (Normal > Heroic) > LFR > Real Raiding™, but guildmates insisted that heroic dungeons are supposed to be harder than LFR nowadays. So now it’s more like Normal Dungeons > LFR > Heroic Dungeons > Real Raiding™. Oh, and LFR is obsolete because of flex, or so I’m told. Well, kinda how it always did. How to improve: Get Kargath some shampoo and open the freaking Tiger Pits, and maybe have some tigers with blades on their paws pop out of them! Yeah, that’s a great idea! How was this even considered a boss? I’ve met snails tougher than that! Oh wait, he gave me loot, therefore, he is a boss. Somehow. How to improve: Get rid of this guy, or at least give him his primary mechanic back. I mean, seriously, he is embarrassing right now. This one seemed more fun with the different kinds of adds spawning. There must’ve been a handful of experienced folk present, because otherwise I cannot explain how the group went in swinging and came out alive without any stacks of Determination. How to improve: First, add more flamethrowers. Second, replace Brackenspore with Thok v2, and instead of mushrooms and plants appearing throughout the fight, have a bunch of mini raptor-sized Thoks show up instead. Their bites would debilitate you in different ways! If you got “Lose a Leg,” you’d experience a 35% reduction to mobility. “Nomming on Your Noggin” would slow your casting speed, and so on. All in all, I do appreciate the move away from encounters where one person doing something stupid at the very start can screw the whole thing up, a la talking to Lorthie or Wrynn and beginning the Galakras fight before a tower team has been chosen (or before everybody’s zoned in). Still, I kind of miss the LFR ToT level of challenge. Okay, okay, I miss the LFR ToT level of challenge minus Durumu and Lei Sheeyit. I definitely miss the snails. I hope there’s something quirky like them in one of the later wings that gives this raid some character. This entry was posted in Bombelina, For the Horde, Baby!, Goblins, OMGWTF, World of Warcraft and tagged bombelina (formerly electrika), brackenspore, highmaul, kargath bladefist, lfr, maybe someday will be better, oh the goblinity, that's probably not good, the butcher, world of warcraft on January 5, 2015 by Prinnie Powah.